The inspiration for this walk came via a beautifully packed little bag containing a ‘Spotty Dog Trail’ – an adventure with instructions – right up my street! Inside the bag was a map with car parking and route instructions, a photo tick list so the children could highlight what they spotted en route and a spotty dog badge as a reward for completing it. Prussia Cove is situated between Helston and Penzance. Head for the village of Roseudgeon and take the turning for Praa Sands. At the hamlet of Porth-en-Alls you will pass a bakery (amazing place in a garage in the middle of nowhere, with a lovely lady owner). It’s open every day in the summer and is a great place to pick up a little something to take with you. Just after the bakery you will see a car park sign on the left. Park here and start your journey. If you don’t have the Spotty Dog Trail, just retrace your steps to the bakery and pass it on your left hand side. Just before a bend in the road, turn left at a public footpath sign and follow a ‘green lane’ heading for the coast. When you reach the coast path, after gasping at the view of St Michael’s Mount before you, head left, keeping the sea on your right. You will pass Cudden Point and Piskie’s Cove. The whole of this coastline is managed by the National Trust. I never cease to support and be grateful to them for keeping this land safe for us all to enjoy, to conserve and preserve it so Wilf, Meg and Sam can hopefully retrace their steps with their grandchildren one day! Shortly you will stumble upon some delightfully derelict fisherman’s cottages and a small beach at Bessy’s Cove. Just before the steps, take the steep path down to the beach where you can see the tracks for smugglers’ carts cut into the rocks. 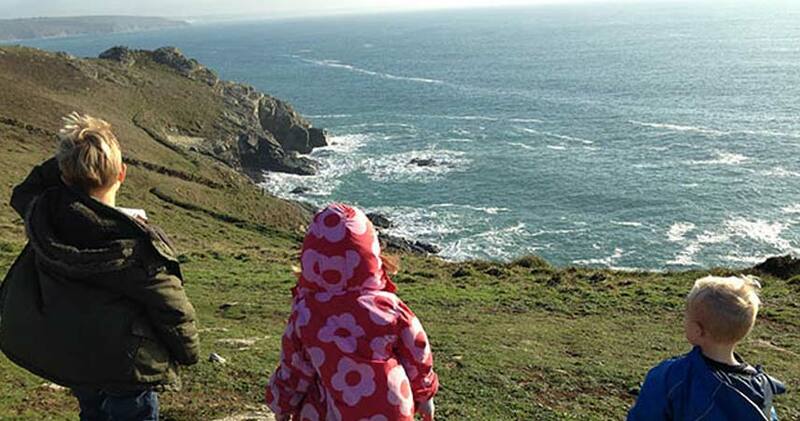 Retrace your steps to the coast path, turn right, up the steps and on to an unmade road. Continue back up the hill, left at the triangle and back to your car. The walk is beautiful and packed with interest. It’s only 1.7 miles, so it’s ideal for a little legs! This area is John Carter territory. There are many stories about this infamous Cornish smuggler, who was called ‘King of Prussia’ and lived in the house at Bessy’s Cove. Ships would sail into the bay and offload their cargo into rowing boats and ferry it to the shore where it was loaded onto carts and stored in caves to be transported via tunnels to the house above. Smuggling was a lucrative business and the smugglers would protect their ships by firing cannons at any navy boat trying to follow them into Prussia Cove. The coast path actually originated as tracks used by the Revenue men in their quest to clamp down on the smuggling trade. What a place to inspire and ignite the imagination! My three are still talking about this day out several weeks later! I suggest you take a picnic, as there are lots of places with stunning views to rest awhile. You can buy the Spotty Dog Trails at the Maritime Museum shop or the Falmouth Museum and Art Gallery, or get in touch with them through their Facebook page. Make sure you check the tide times before you set out, or you might find the beach is covered by the sea! Follow the directions above, or if you’re using a SatNav, the post code is TR20 9BA. PS: If you spot any pirates, let us know!